L’Artisan Parfumeur Timbuktu: A hike will be part of my agenda (or, as I like to think of it, “a pleasant walk outdoors”), and I’ll want a fragrance that captures the briskness of desert air, conifers and clay soil. Plus a pinch of glamour. A modest application of Timbuktu fits the bill. Since I don’t own pants — who needs all that tug and pinch? — I’ll be hiking in Sorel boots and a vintage floral cotton day dress, with a cardigan I can tie around my waist if need be. Guerlain Shalimar: Back in the day when businessmen drank martinis at lunch, Palm Springs was a favorite of celebrities, including Frank Sinatra. According to the Celebrity Fragrance Guide, Shirley MacLaine — the Rat Pack’s only gal — wore Shalimar. (Nice choice for a redhead, Shirley.) A drop of Shalimar is just the thing for scoping out a bar of Dean Martin’s vintage. A shantung silk early 1960s cocktail dress completes the ensemble. Since we’re dreaming, I’ll add a pair of Roger Vivier flats. Bottega Veneta Knot: Did I mention there’s a pool? Knot is a good one to wear lounging at its edge, under an umbrella and coated with sunscreen, of course. Knot's crisp orange blossom goes well with the Thea Porter caftan I’d wear (I wish) or my very full-coverage maillot. As a bonus, Knot segues nicely to Shalimar. Chanel Cuir de Russie: I plan to do lots of writing, so I need an unobtrusive, smart fragrance to help me focus. Cuir de Russie is a good taskmaster. It’s beautiful, but not easy or particularly pretty. Cuir de Russie’s iris and leather-whip edge would keep me at the laptop. Writing brings down my body temperature, so I’ll wear a loose dress with leggings and a light shawl I can use to wrap whatever needs swaddling. Ayurvedic Recipe Shea Avocado Cream: This cream smells of lemongrass, and I get it at my co-op. Its fragrance is pungent for about a minute, then fades to a fresh, calming murmur. I’m taking a budget flight and don’t want to wear scent that will bother nearby passengers on what are sure to be slivers of seats crammed cheek-by-jowl, but quiet lemongrass — and moisture — will be medicine. 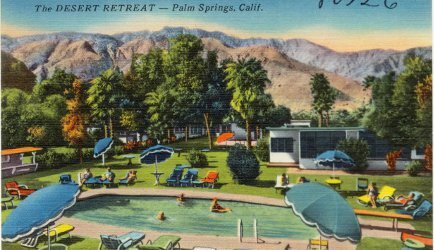 Note: top image is The Desert Retreat, Palm Springs, Calif. [cropped] from The Tichnor Brothers Collection of postcards at the Boston Public Library. Fragrances for a winter getaway? St Clair Scents First Cut and Casablanca, 1000 Flowers Reglisse Noire and Rose Cassis Paradis and Natura Amor America Paramela. And I haven’t tried a single one of these…. My of fragrances to try is wickedly long! Try to get your nose on Casablanca…it has a real vintage vibe. I think Terre d’Hermes parfum would be great for Palm Springs! Nice choice! I think you’re absolutely right. I second that! I love Palm Springs – was there for a week in March a few years ago. One sister and her partner go every year now for a month. I may go again in March. I wore scents like Hermes Eau d’Orange Verte and Voyage, plus Goutal Mandragore and the Bvlgari green and blue tea scents. I’m not elegant… more of a casual style for me! Knot would be really nice too. We had lemon trees in bloom on the patio by the pool. You should check out Village Fest held on Thursday evenings… Artists and craftspeople & music. I did hit the Goodwill and managed to score a few things. The desert is gorgeous, the mid-century houses too. Hope you enjoy it as much as I did! Thank you for the recommendations! I’m really looking forward to getting away for a few days. Your fragrance suggestions are great, too, and now I’m craving Mandragore. I’ve smelled real lemon blossoms, and they’re stunning. No Tom Ford? Isn’t he a Palm Springs person? I admire your walking outfit, very stylish. I wouldn’t know about Tom Ford, but I wouldn’t be surprised. Loving all the imagery in you post! I wish I was this sophisticated and elegant, but alas I clomp around in muddy red Wellingtons, flannel and denim, and my scent never matches. No affiliation, but thought if you are an Instagram fan, you might be interested in @theladylangston. She lives her live in retro clothes, hair and makeup, mostly taken from the 50’s to my uneducated eye. I believe she sews much of her own clothing as well, and her fabric choices are amazing. The fit is fabulous, and I admit to a bit of style envy. Thank you! I’m on instagram but am really, really lame about checking in. The Lady Langston sounds just like my thing, though. I love the desert! I would take Philosykos, Do Son, Lonesome Rider and the remainder of my sample of Tom Ford’s Lavendar Palm. Have a glorious trip! Ooh, nice choices! And thank you! We go to PS quite a bit, like you trying to escape the dreary PacNW winters for a weeks or two. I always take Creed White Flowers which works perfectly in the heat. When in PS make sure to have brunch at Tropicale (sit on the patio-it’s beautiful), and if you want a great burger go to Tyler’s. Both restaurants are downtown. Have a great time! Thank you for the suggestions! I love the idea of brunching on a patio. I hadn’t thought about bringing a white floral, but I bet Queen of the Night would be a good one, too. I don’t know Palm Springs, but I’d take both Eau des Merveilles and L’Ambre des Merveilles, and layer them as needed to adjust for warmer or cooler weather. Meanwhile, I’m on a summer beach holiday and it’s Dali Laguna every day for me. 😀 Perfect. Hermes is getting a lot of love today! I like your suggestion of bringing different Merveilles. My parents spend a month every year in Palm Springs, so I do a couple of day trips from San Diego to visit them. Knot sounds perfect. Timbuktu sounds great to me too. It’s pretty dry out there so bring moisturizer. Maybe one of the Jardins? Have good hunting at the thrift stores! Thank you! I’ll report back. One of my favorite things about a vacation. Give me a car and a smartphone and I’ll hunt for hours! If I was packing one fragrance (as I too wouldn’t allow myself the luxury of a checked bag) it would probably be vintage Silences PdT, slick green fading slowly into an obsessive base. Perfect for a festive cocktail party or gossiping under a pool umbrella. I’m a man and our fashion doesn’t often age well (Ricky Ricardo suits anyone?) but my signature Jhane Barnes button-downs fit every mood. I should have said, have a wonderful time! I never would have thought of Occur! Your choices could easily be mine. While wearing your silk shantung dress and Shalimar, I hope you’ll be sipping a classic martini! Great perfume choice, Angela, for Palm Springs. That’s so funny! Fleurs de Rocaille is so soft and feminine, and to me Ava has a lot more va-voom going on. I could see her rocking Mitsouko.